The item How to win friends and influence people (on twitter), Dr. Nick Campos represents a specific, individual, material embodiment of a distinct intellectual or artistic creation found in Evansville Vanderburgh Public Library. "Do we really need another book about Twitter or social media?" Well, what you are about to read is not merely a book about being successful on the social media site Twitter, but also about how to be successful in life, because many of the tools, behaviors and actions that ensure success in the virtual world, also do so in the real world. How to Win Friends and Influence People (on Twitter) is a guide for stars. 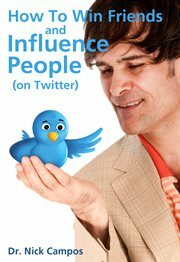 Yes, other books will teach you the definition of a retweet, but this book will help you become a Twitter RockStar. Twitter is the most powerful platform on the planet for people to spread their inspired messages. Experts, teachers, sales people, doctors, artists, moguls, and journalists all have a platform by which to tell the world about what inspires them. And it's not limited to professionals, either: housewives, teenagers, and just regular every day folk are finding their voice on Twitter. Within these pages are the secrets to transforming oneself into a magnetically effective spokesperson for one's cause, and how one can use social media, specifically Twitter, to achieve this end. By having an inspired message, talking about what you love, producing original content, interacting with others, and being appreciative of those that help you spread your word, you will see your influence grow in quality and magnitude. But those are only a small fraction of the tools uncovered in these pages. You will also learn the basics of Twitter-the terms, nuances and etiquette which make this media so powerful, and so engaging-as well as universal factors of influence, and how to become a people magnet, and more! You can become the next expert in the area you love-with Twitter anybody can shine. And becoming a magnetic force of influence is no longer solely reserved for those with special attributes or connections-technology has given us all an opportunity to effectively spread our inspired messages. Through the little blue bird, every one of us has the opportunity and ability to become a Twitter (and real world) SuperStar-so use it to your advantage. Tweet, tweet..